In this beautiful fast paced world we are always on the go go go. We forget to reach out to our loved ones, our friends and we even forget to take some moments to recharge and reach out to ourselves. After being in Los Angeles for almost five years working non stop I decided to break the routines, break the patterns & return to travel which is what I love the most. Traveling for me is so freeing, it frees my mind, it frees my heart, it frees me from any and all small obligations with others & those little nuances that we all get caught up in. It was time to take a break from the day to day and time to take a break from all the electronics. Being of Greek origin, I decided to take a holiday ticket one way straight to the islands of Greece to connect with my roots and the ancient history. First I arrived at Santa Marina Mykonos, what better way to start a holiday than seeing Greek family who are also on a holiday to!? We were able to talk, share moments, and honor the important things that are going on in each others lives face to face, hand in hand. It’s so healthy to get out of ones comfort zone and have a free safe space to release what is going on inside: mind, body, soul & spirit. Now it was time to go within, get still and take care of self. I found this really cute brand new hotel & spa Mykonos Riviera. 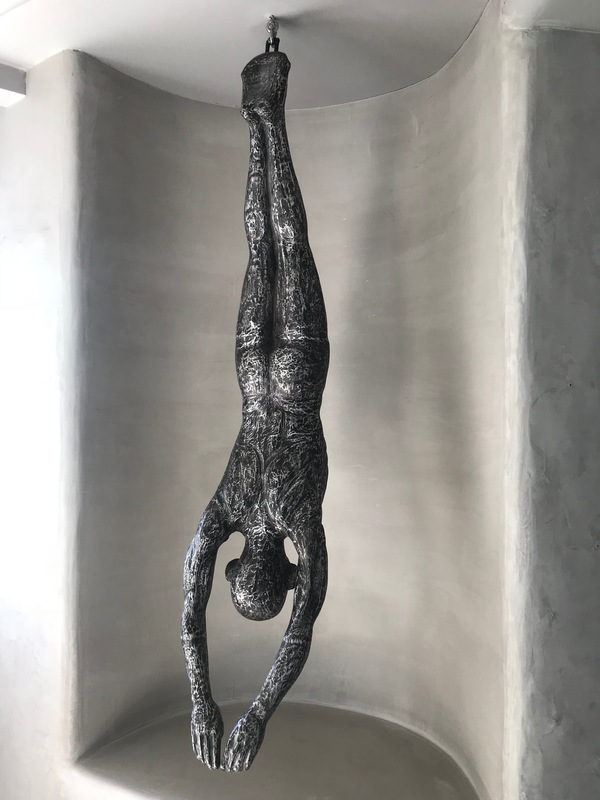 Dream state as soon as I walked into Mykonos Riviera, it honors the voice of everything simplistic, peace, clean, and elegant with a modern cave like feel with a beautiful statue standing alone from the ceiling. I had my brand new book in hand by Gary Zukav author of Seat of the Soul – There are two magnificent forwards by Oprah Winfrey & Mya Angelou — if you have not yet it’s a MUST read! Now let’s get to more healing….. I live in two cities so it was really important for me to detox and have the City- Life “Sorbet” facial. It was an hour long but when I woke up it felt like 3 hours. They had this seaweed mask on my back the whole time while the bed was heated as the seaweed was pulling toxins from my spine. A specialized treatment that combats environmental pollution for restoration of freshness and brightness of the skin. The cocktail of healthy ingredients, becomes a natural shield against environmental pollution and instantly moisturizes, decongests and illuminated dull and tired skin. After facial glow, I was feeling so relaxed inside and out, so nurtured, so uplifted & rested. Health is Wealth so we must be mindful of what we put into our bodies. Indoor heated pool at Oqua Spa – mineral-rich seawaters to treat various health & beauty matters, from improving skin conditions to reducing cellulite and relieving muscular pain. Restore you health and sense of well-being. The Oqua Spa of Mykonos Riviera is a 500 square meter haven of wellness and relaxation; the perfect place to realign, reenergize, and rejuvenate. And all that through a wealth of health and fitness services offered and guided by experienced practitioners, in an ambiance that exudes tranquil luxury. This beautifully designed sanctuary features a naturally lit indoor heated thalassotherapy pool, hammam rituals, sauna, and 6 treatment rooms. The Oqua Spa services of Mykonos Riviera include facials, deep cleansing, scrubs, detoxification sessions, deep hydration, numerous types of massages, aqua treatments, and beauty treatments. The staff was kind, professional and caring. When going on a self exploration retreat it’s important to know that the staff have our best interests as well. I have been to spas all around the world and my experience here was one of the best. Kyriaki enjoys health, wellness, education & has gratefully traveled the world. Kyriaki appears in films, tv shows, & is a voice-over actor in animation video games. Kyriaki has a love for animals & serves as a brand ambassador for Vets International. Kyriaki is excited to be a part of Thrive Global’s mission to help people acknowledge & combat the stress and burnout epidemic.